"Then up the ladder of the earth I climbed, through the barbed jungle's thickets until I reach you Machu Picchu. Tall city of stepped stone, home at long last of whatever earth had never hidden in her sleeping clothes. In you two lineages that had run parallel met where the cradle both of man and light rocked in a wind of thorms. High reef of the human dawn. Spade buried in primordial sand. This was the habitation, this is the site! here the fat grains of maize grew high to fall again like red hail..."
(Pablo Neruda, Nobel Prize, Hights of Machu Picchu). Our Inca Trail Private Service is perfect for families with young children, group of friends and/or honeymooners. With smaller groups you get the full attention to detail of our expert guides and with each trekker having a personal porter to carry kg of your gear you can enjoy the trek to the full. A trek with Llama Path is the best way to get to Machu Picchu, because it allows you to truly immerse yourself in the Incan history and culture, so you really appreciate Machu Picchu when you finally arrive. On this trip it really is about the Journey not the Desination. And all the Llama Path staff will work very hard to make your Journey unforgettable. The trip is breathtaking, not only because you're at altitude, but because you're smack right in the middle of the Peruvian Andes, and as far as the eye could see there was one peak or ridge after another. After a bit of coca leaves and llipta (ask your Guides for) the tangy and bitter taste filling one's mouth, you feel as though you could 'run' to the top of Dead Woman's Pass and back and feel your inner Inca coming out. Our knowledgeable leaders will Guide you the way and our amazing porters (The 'Red Army') race by to set up camp for the coming night, you passed through ancient walkways, ruins, valleys and cloud forests. Llama Path will do every possible effort from start to finish with this trip, from the pre-trek debriefing to all of the transportation to and from, and everything in between. 'Gaining weight' on this adventure trek is likely with the amazing and abundant amount of food available at every meal. Join us now! We offer daily departures on the Inca Trail (excluding February when the trail is closed). Campsites may change depending on booking time and availability, weather conditions or on restrictions undertaken for safety reasons by the Peruvian Goverment. The first day of the Inca Trail is easy going to help you settle in to the trek. Covering 14km of the trail climbing gently up the Cusichaca Valley you pass by the Inca site of Llactapata, enjoy great views of the snow-capped peak Veronica (5900m / 19000ft) and get to see a variety of native plant life and birds throughout the day. Today is considered by many to be the hardest day of the trek; with 2 high passes (Dead Woman's Pass is the highest at 4200m / 13779ft) to cross and nearly 16km to walk today really tests your spirit. There's no need to worry though as thanks to our enthusiastic guides and team of porters helping you along you'll have all the morale and physical support you need to make it. Today we get fantastic views of the high mountain ranges as we cross the 2 passes and will have the chance to visit 2 Inca sites (Runcuraccay and Sayacmarca). We will also see a variety of plant and life in the Polylepsis forests that cover this area and hopefully spot White Tailed Deer as we near Dead Woman's Pass. Our campsite tonight is at Chaquicocha (3600m / 11800ft) which like Ayapata is one of the quieter campsites and affords beautiful views of the sunsetting over the mountains in the distance. Having made it over the 2 passes yesterday we're now treated to a relaxing day through some of the most beautiful scenery the Inca Trail has to offer. With a relatively short distance to cover along what is known as Inca Flat (gentle ascents and descents) we get to enjoy the lush and verdant cloud forest around us and the spectacular views of the Andes in the distance. With visits to 2 Inca sites (Phuyupatamarca and Winay Wayna) this is by far one of the most impressive days of the trek. Our campsite for tonight is at Winay Wayna (2680m / 8792ft) which we will arrive to be early afternoon and get to have an extended guided tour of once we have settled in. Today is the highlight of the trek. Waking up early you head straight to the checkpoint to enter Machu Picchu and once the site opens can carry on to the Sun Gate where you'll get your first fantastic views of Machu Picchu. On arrival to Machu Picchu you'll have a 2 hour guided tour of the site during which you'll learn about the Incas and visit all the most important areas of the citadel. After your tour you'll have free time to explore the site by yourself and if you have permits to climb either Huayna Picchu or Machu Picchu mountain. In the afternoon you will take the train back to Ollantaytambo from where you will carry on by bus back to Cusco. 3 Breakfasts, 3 Lunches, 3 Afternoon Snacks and 3 Dinners. If you have a dietary request such as vegetarian food please let us know. 4 day Private Service Prices 2019 (For all groups leaving from 1st March 2019 till 31st January 2020. All prices include a half Porter to carry up to 8 kilograms of your personal belongings. Also Includes Vistadome /Panoramico Train 360° train on the way back to Cusco. 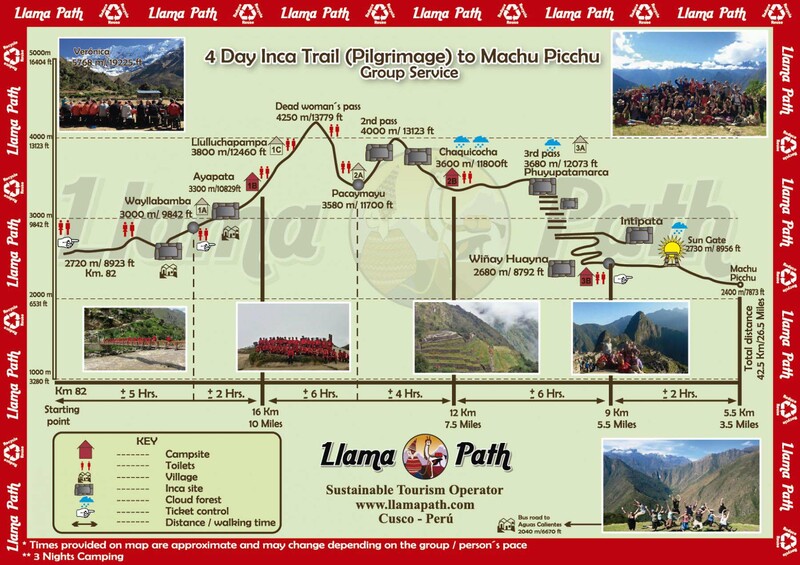 Please Note Inca Trail permit fee is included in the Price. Student Discount: US$40 (Requires Univeristy Student Card to qualify - you must NOT be older than 25 YO). Extra/ADITIONAL Night in Aguas Calientes: PRICE Depends on the type of Hotel desired. options’ choose your preferred Card payment option and follow the instructions. Llama Path must be notified of any changes or cancellations to your trip as soon as you are aware of them, via e-mail so that we do not incur expenses not covered by deposit.